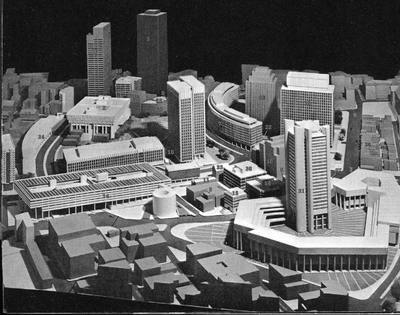 Government Center Area Model, from a late 1960s Boston Redevelopment Authority pamphlet. Click for a larger image. While cleaning up my bookshelves recently, I came across the "Government Center" pamphlet, which was published by the Boston Redevelopment Authority in the late 1960s. I thought people might be interested in seeing exactly how much of the Government Center urban renewal plan was ultimately carried out. For example, Number 24 in the illustration, a proposed motel/office building that would have fronted Congress Street was never built and is now the site of the New England Holocaust Memorial. Likewise, the tower for the State Service Center (No. 31) never came to fruition. An aerial map makes for a good comparison. I've also written about Government Center before. Government Center is a complex of buildings, plazas and pedestrian malls that has revitalized the downtown core of Boston. Carried out under a master plan given final form by the architectural firm of I.M. Pei and Partners in 1961, Government Center has tried to respect the historic character of Old Boston while expressing the energy and growth of the New Boston. A Federally-aided urban renewal project covering 60 acres in the heart of Boston, Government Center includes city, state and Federal office facilities as well as private office buildings. The new Boston City Hall (2), set in a nine-acre plaza, is the Center's major focus. It was one of the first urban renewal project's undertaken by the Boston Redevelopment Authority (BRA}, with assistance from the Government Center Commission. Approaching completion under the leadership of Mayor Kevin H. White, it will ultimately contain nearly 30 buildings worth $260 million. Government Center was conceived in 1954 when it became apparent that the city, state, and Federal governments were contemplating new construction in Boston. The BRA believed that major government construction would encourage massive private investment in the same area and this has proved to be the case. The site chosen for this large scale government and private construction was Scollay Square--a rundown entertainment and retail district. It was considered an ideal location for development partly because of the area's desperate need for physical improvement, but also because of its accessibility and proximity to established retail and office centers in Boston. Government Center is close to the shopping district concentrated along Washington Street. It is near Boston's business and financial center. It is next to Beacon Hill, with its residential area, the State House, the Suffolk County Court House (32), and to the residential West End urban renewal area. Served by three subway lines, it is also adjacent to the downtown expressway, the Central Artery. Encompassed within Government Center are several historic buildings--the Old State House (19), Faneuil Hall (12) and the Sears Crescent (29). Government Center is best explored on foot, through its many malls, shops, pedestrian passages and plazas. One of its aims is to restore this part of the city, which dates back to Colonial times, to the pedestrian scale it had originally. The following are buildings that comprise Government Center. A key at the back of the booklet [see key above] indicates their location in the Center. Boston's New City Hall is the result of an architectural competition in 1962 won by the firm of Kallmann, McKinnell and Knowles. Built at an estimated cost of $27 million (financed by municipal bonds issued by the Government Center Commission), it encloses 318,000 square feet of office space. The City Hall houses three separate functions of city government that are reflected in the design and structure of the building. The lower floors, built into the side of Beacon Hill, contain the offices most often visited by the public and most easily reached. The upper four floors, in the "cap", house city departments requiring flexible office space and visited less often by the public. Suspended between these two sections are the Mayor's office and the City Council Chambers, visible to all and directly accessible by a large brick stairway. Adjacent to the City Hall is the nine acre City Hall Square (9). Its red brick continues through the City Hall, as an extension of Beacon Hill, and down to Dock Square (10) and Faneuil Hall. The Sears Block and Sears Crescent (28, 29) are reminders of Boston's past, in scale, location and building materials. Built in the early 19th century, they soon became the nucleus of Boston's book center. The area attracted writers, artists and poets, Hawthorne and Emerson among them. The Sears Crescent housed "The Christian Freeman", an abolitionist journal, in the mid-1800s. The buildings are now being renovated. The granite Sears Block (28), the corner building, is the home of the 294-gallon "Steaming Kettle", and the brick Sears Crescent (29) will contain shops and offices when completed. The John F. Kennedy Federal Office Building (16) consists of a 26-story tower and a 4-story lower section. The tower houses Federal agencies serving the New England region. District offices, more often visited by area residents, are in the low building along with an employees' cafeteria. A glass bridge links the two and contains a mural by Robert Motherwell. The tower is split, with elevators in the middle, to make the building less massive and provide direct daylight to almost all offices. Center Plaza Office Building (7). One, Two, and Three Center Plaza, an 8-story, 875-foot- long private office building, is one of the longest office facilities in the United States. The ground-floor arcade contains small shops and there is parking for 500 cars in the lower level of the building. Its curved shape follows the contours of the foot of Beacon Hill and mirrors the neighboring historic Sears Crescent. The brick-and-concrete exterior is reminiscent of traditional Boston architecture. On the inside curve of the building is Pemberton Square. A fashionable residential area in the 19th century, it has been redesigned by Kallmann and McKinnell as an automobile and pedestrian way. The State Service Center (31) now under construction, will be completed in 1972. It will house the State Department of Health, Education and Welfare, the Division of Employment Security, and the State Mental Health Center in an eight-acre complex built around a large plaza. The lower sections will be 5 stories, with a 30-story tower. Paul Rudolph, the coordinating architect, set the design criteria followed by the three participating architectural firms. The Old State House (19) built 1712-13, was the seat of Boston's colonial government, and the symbols of British rule, the lion and unicorn, still remain on the facade.. It served as the State House for Massachusetts after the Revolution until the completion of Charles Bulfinch's "new" State House on Beacon Hill in 1798. The Old State House now contains a museum and a subway station. New England Merchants National Bank (17) The 40-story New England Merchants National Bank contains the bank's facilities and leased office space as well. Its architects used pink granite on the outside of the building to serve as a link between Boston's traditional red brick architecture and the modern architecture of Government Center. The building marks a major entrance to the Center at the foot of Washington Street. Faneuil Hall (12) was built in 1740-42 as a market and assembly hall and is still used for these purposes. Burned and rebuilt in the mid-18th century, it was enlarged in 1806 by Charles Bulfinch. The gold grasshopper weathervane on its lantern tower was the symbol of Boston for arriving clipper ships in the 18th and 19th centuries [note: clipper ships were designed in the 19th century]. In front of Faneuil Hall is Quincy Market, designed by Alexander Parris. Built in 1824-26, the area was Boston's first urban renewal project and has served as commercial space for 150 years. Mayor Kevin H. White has proposed a $10 million renovation program for the area. Faneuil Hall and Quincy Market are in the Waterfront Urban Renewal Area. This is the most awesomest post, ever! I love the photo of how it was all supposed to work out. Even I, defender of the new, have to say I HATE City Hall Plaza and just about every building around it. I was looking through a book yesterday which had photos of Scollay Square, and the author said that the building in front of the Sears Crescent building was actually torn down. Does this mean the kettle was taken down & put back up, on the building that remained? Thanks for a great post. I will look at that photo, all the time. Have you read the book "Always Something Doing: Boston's Infamous Scollay Square"? I picked up a copy of it at the New England Mobile Book Fair recently in Newton - it was on sale there for only $5. I haven't yet had a chance to read it, but it looks like it's quite a nice collection of pictures and recollections of Scollay Square in its heyday. Strangely, I haven't seen this book in any other bookstores around Boston. The author of that book, David Kruh, has a whole web site about Scollay Square. He has also put out a second book on ths subject, as part of the Arcadia "Images of America" series.